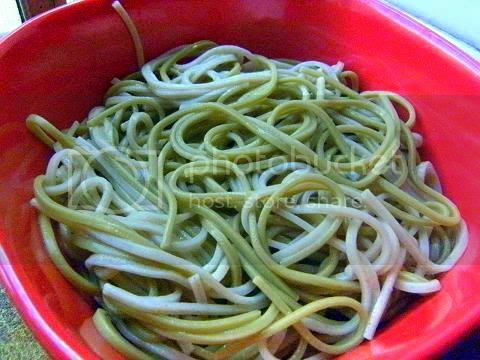 Soba is a type of thin Japanese noodle made from buckwheat flour. It is served either chilled with a dipping sauce, or in hot broth as a noodle soup. It takes three months for buckwheat to be ready for harvest, so it can be harvested four times a year, mainly in spring, summer, and autumn. Hiyashi Soba is a popular dish in summer. It's like a noodle salad. Restaurants in Japan serve Hiyashi Soba only in summer. 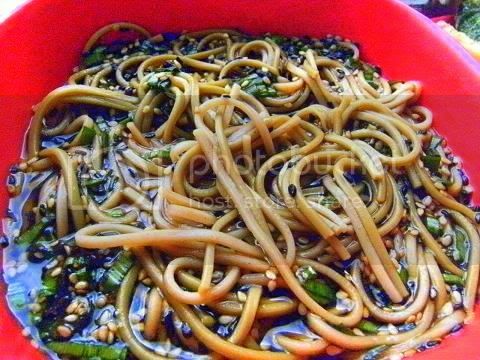 Even if you don't have much appetite because of the heat, Hiyashi Soba can be appetizing. Common Hiyashi Soba toppings are omelet strips, ham, cucumber and grated Daikon. You can also have the noodles just with the dipping sauce. 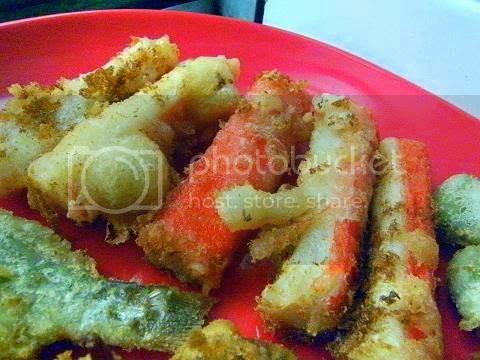 Tempura is a Japanese dish of seafood or vegetables that have been battered and deep fried. A light batter is made of cold water (sometimes sparklinhttp://www.blogger.com/img/blank.gifg water is used to keep the batter light and soft wheat flour (cake, pastry or all-purpose flour). Eggs, baking soda or baking powder, starch, oil, and/or spices may also be added. From the website acquiredflavor.blogspot.com the information is stated. Well... it may interest you to know that the Portuguese were the ones who introduced tempura to the Japanese way back in the 1500s when they landed in Japan along with establishing trade routes and bringing Catholicism. 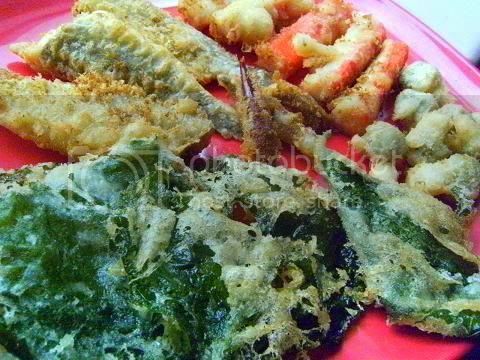 The battered seafood and vegetable dish was apparently loved so much by Tokugawa Ieyasu, founder and first shogun of the Tokugawa shogunate, that he died after eating too much tempura. I don't know if this is true as I think one would pass out before they could that! Recipe Source: I’ve had many different versions of this dish so I’ve combined a few different recipes from around the WWW. Most notably: Zaru Soba Noodles from About.com-Japanese Food; Zaru Soba from Globetrotter Diaries; Perfect Tempura from Pink Bites; Tempura from Itsy Bitsy Foodies; and my Japanese stepmother. See here for a PDF of the challenge. WOW this is a marvellous challenge! 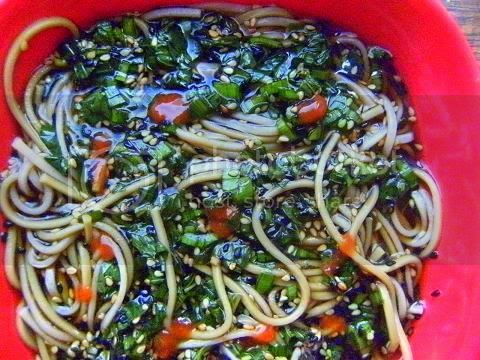 I used a mixture of store-bought natural flavoured soda noodles & green tea soba noddles, I made the broth for the noddles using instant benito soup powder, tangle weed powder, sea weed paste, double deluxe soy sauce and rice-fermented mirin, I used chives/mint instead of the spring onions, I added some dark sesame oil and a mixture of flavoured (bamboo, wasabi, BBQ and teriyaki) sesame seeds and some hot chilli sauce. I chilled the noddles. OMG I never realised how good chilled soba noodles are for a hot summer's day as we having in Sydney Australia at the moment. This is the perfect lunch so easy to make and so delicious. 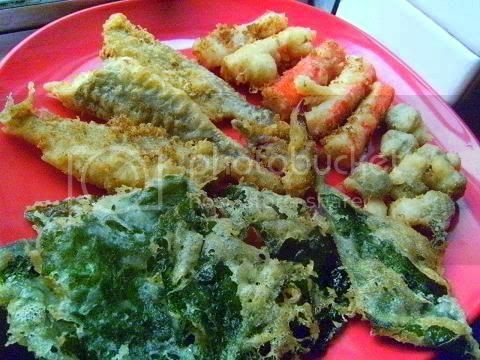 I used perilla leaves, raw prawns, raw prawn heads, sweet potatoes, peaches and bananas for my tempura. I made up the batter using chilled soda water and added some ice cubes. The batter looks very thin but it is perfect to use. You really do need to dredge your ingredients in flour I forgot to do it for the first perilla leaf and the batter wouldn't stick at all. I noticed that the batter became thicker and thicker when it was used up this is because we only lightly combine the batter ingredients (I didn't want to activate the gluten in the batter so I only mixed the batter a couple of times with chop sticks) so there was a slightly heavier flour layer on the bottom of the batter bowl so if you want a thicker layer of batter on your ingredient dip right down to the bottom of the bowl so it will be coated in a thicker batter. 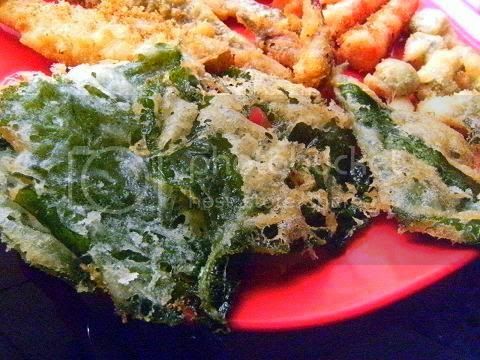 Notice how thin the batter is on the tempura (especially on the perilla leaves which I deep fried first) remember we are not making fritters so in tempura the base ingredient will show through in places. Notice how the prawns and the fruit have a thicker tempura layer on them since at this stage I had to use the batter from the bottom of the bowl. I was stunned how great tempura is! 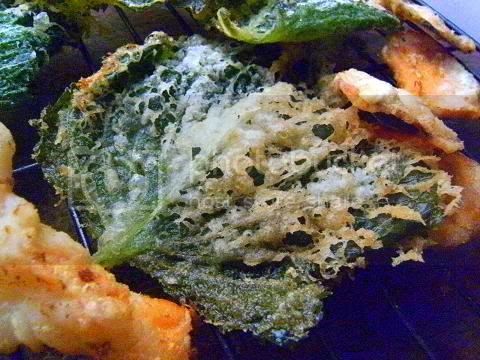 The perilla leaves are astounding the leaves are so tasty (they taste like a combination of basil, mint and lemon grass with a touch of apple) and with the crisp layer of tempura which makes for a total sensory overload of yumminess these were my favourite of all the tempura I made. The sweet potato are crunchy and crispy and the sweet potato flavour comes out to the forefront. The prawns and prawn heads are sweet and the skins of the prawn heads are a great contrast and the fruit are a great treat at the end of the feast the peaches are extra special (my second favourite tempura) and the banana with the crisp batter layer are so delicious and so so so good these would be great with ice cream and chocolate sauce. 1. Try to keep the oil clean at all time use a very fine sieve to strain the oil often this stops the loose cooked pieces of tempura batter from sticking onto new pieces of uncooked tempura which spoils their appearance. Remove the remnants of batter between each batch so they don't burn and leave a bad flavour in the oil. 2. I used rice bran oil I hate the strange fishy smell that canola oil has when used for deep frying. 3. Try to keep the batter layer thin and deep fry only until crisp do not brown to much if you can help it. A very light golden colour is fine. 4. Use a couple of ice cubes in the batter to keep it cold at all time. Only make the batter just before you need to use it as it becomes gluey if left for too long. 5. Test the heat of the oil by dropping in a small amount of batter. If it sizzles immediately, the oil is hot enough to use. 6. Drying on a wire rack works much better than using paper towels. 7. You can reuse the oil again cool to room temperature, strain using a very fine sieve lined with paper towels. Taste to make sure that the oil isn't flavoured too much from the deep frying. Then you can use it again (about 4-5 times) for shallow frying and deep frying, when the oil becomes cloudy discard. 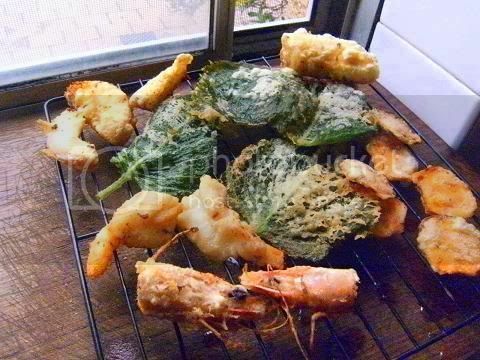 Here is a fabulous egullet forum thread about tempura cooking using very traditional ingredients it discusses many aspects of this challenge it even has some information about soba noodles highly recommended! It explains the difference between making tempura and making fritters. The photos are very informative. "What colour should cooked tempura batter be?" Japanese cooks insist that tempura should have no colour (or as little as possible) when cooked and that the batter layer shouldn't evenly coat the ingredient like in a fritter i.e. 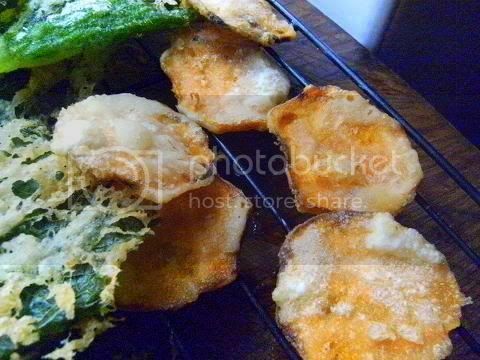 your ingredient can show through in places in a tempura. The cooked batter shouldn't be bread-y and it should be crisp and not greasy in many Japanese restaurants in Sydney they serve tempura on paper boards which becomes transparent if the tempura is too greasy. See the photos in this thread. "Do we use raw seafood in tempura?" 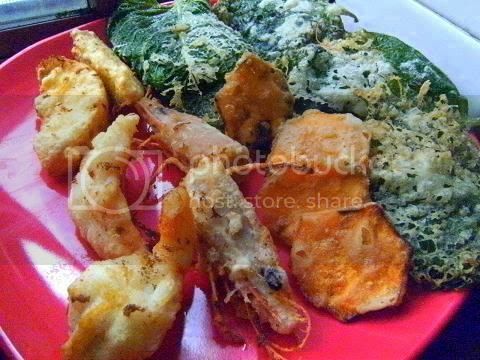 the usual practice is to use green (raw) prawns (shrimp) and raw seafood BUT I have seen a number of sites that used large frozen cooked prawns with some success also crab sticks are used a lot in many places. A key to success to tempura making is to make sure that each item to be deep-fried is dry (free from moisture on the surface) before coating with tempura batter. Use paper towels, if required. Otherwise, it will take more time to deep-fry than necessary. 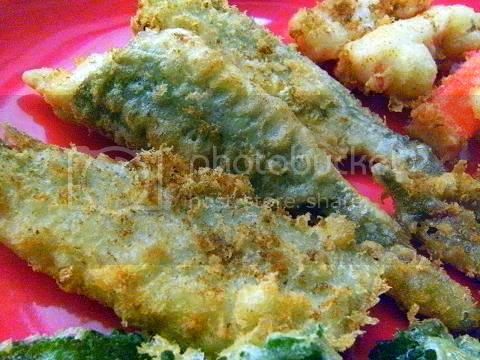 I wanted to make a special Valentine's day present for the neighbour she is Greek she has been so nice to me lately I decided to treat her with a lunch of tempura using her favourite Greek ingredients. 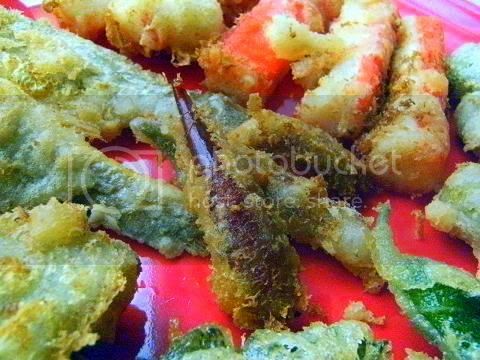 She loves olives, a small fish she calls bony grouper, crab, marinated chillies and dry apple cider so that is exactly what I tempura'd I also added my favourite perilla leaves. I used the apple cider in the tempura batter I noticed that the final deep fried tempura layer was very light and crispy. What a lovely lunch this was, I absolutely adored it, the olives and chillies were lovely salty and spicy and the bony grouper was so tender. Crab sticks and perilla leaves are a lovely combination. Ive never tried making tempura at home. Come to think of it, I've seldom had it in a restaurant, either. This is something to think about doing! What an international flair! Greek Japanese food... I love it. I think my husband might kill to try those tempura-ed olives...! Thank you so much for your help and guidance, and for showing us all how much fun it is to be truly Daring!! Audax! You made so many interesting variations! As always, you were so supportive to all members and first timers, like myself. I'm sure your Greek friend had a wonderful time and enjoyed all the deliciousness of your Valentine's gift! Wow Audax, love the variety of tempura you came up with! I'm drooling over the banana tempura, they must have tasted so good. 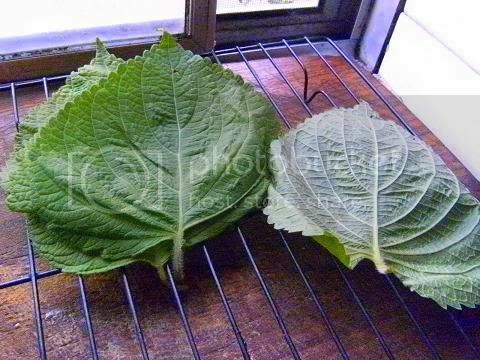 I'm getting intrigued with the perilla leaves, I will definitely look for that and try it. Great job! This looks so great. I am definitely going to make it again. The olives looks good. It has never occured to me to tempura them. I've breadcrumbed them before That was good. Tempuraed would be so much easier. Love all the variety Audax, it all looks so good! Bravo! 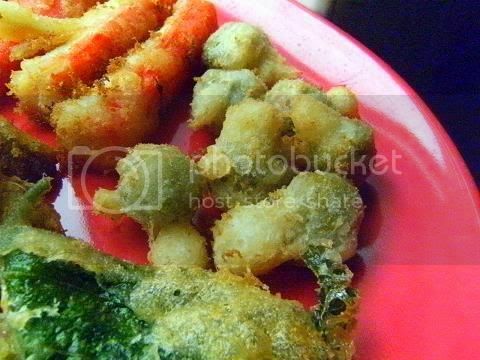 Love the many different tempura that you made - the olive tempura sounds so tasty, would be great with beer! Great job on this challenge! 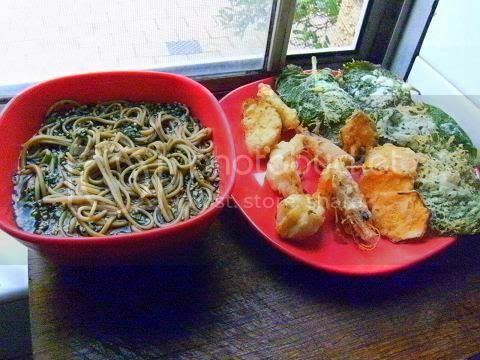 Your tempura and noodles look wonderful!! Love the Greek and fruit tempura - you always choose a really creative interpretation of these challenges!! Great stuff! Love your tempura, Audax! The olive ones sound wonderful! It all sounds so fantastic, but I am really intrigued by some of your less traditional options, especially the olives and the fruit! You have a very lucky neighbour. Thanks very much for your comment--I am trying to take better pictures, but it's a struggle. Can't wait for the next challenge! Mmmm! Peach and banana tempura. I wish I had tried that! 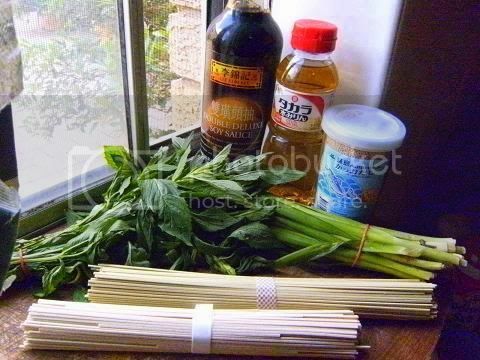 Perilla leaves and green tea soba? As usual you have outdone yourself. These ingredients sound so great. Congrats on another successful challenged completed! So many great variations! I love the idea of the bananas and peaches in the tempura. 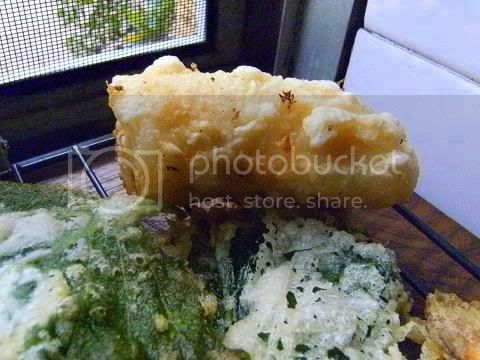 Wow - your Greek tempura looks so good - especially those small bony fish. You are always so creative with these challenges! Well done. I wish i could be your neighbor, awesome tempura and cold soba noodles. What can I say... Audax you amaze me! When do you find time for all this?!? I wish I could do as many variations of each challenge as you :] As always - great job and the choice is amazing! Peacch, banana, olive? Oh my! That sounds incredible. I wish I was a guest in your kitchen. I imagine it would be quite the treat! wow, greek tempura sounds so interesting. your spread looks fabulous as always. you always take these challenges to the next level. i'm eager to for next month! cheers. Inspired as always! What a fantastic array. I love the tempura olives and the apple cider in the batter. Ooh, and the fruit tempura too. Brilliant stuff. I made the infamous Audax speechless? Now that is very high praise indeed, I blushed when I saw your comment come through. Thank you oh so much! Wonderfully explained as always. I didn't get the chance to try the perilla leaves this time but will in the future. I like how you added so many things to the noodles. What a wonderful array of ingredients you have used. Thank you for introducing me to Perilla leaves, which I had never heard of. Your dishes look wonderful, and so generous, as have you been with all of the information you have provided us all. What a great community member you are. 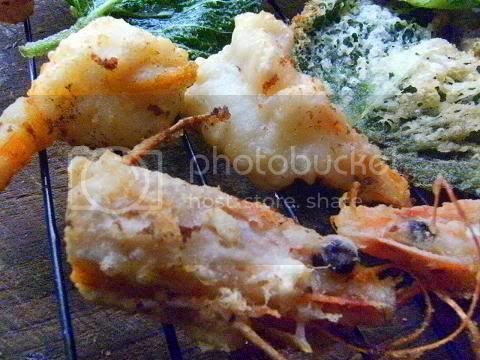 Your tempura looks absolutely amazing - wonderful texture and light batter! This all looks amazing! Great job! Audax - It's always such a mystery who eats all this wonderful food you prepare! So many incredible sounding variations, you must dream about food every night. I must try the green tea soba noodles, and sweet potatoes are one of my favorite tempura ingredients. Excellent, as always. 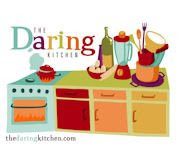 I love how you go all out with the Daring Kitchen challenges! So many interesting ingredients. I had never heard of perilla leaves as we don't have them here, but they sound great. I'm dying to try peach and banana tempura now! Well done, and so informative as always. Nice work! I love how you always put your own spin on things- sign of a master! :) Creative! A great post. I love the way you really get into these challenges and are so interesting in doing so. I am very curious about the perilla/shiso - where did you get it? I don't think I have seen it - I am in the year inner west by the way. Your tempura looks great! I love the banana idea. I will also use your tips of dredging in flour before dipping in the batter next time. Thanks! Audax, I had no idea so many different things could be "tempura-ed"! 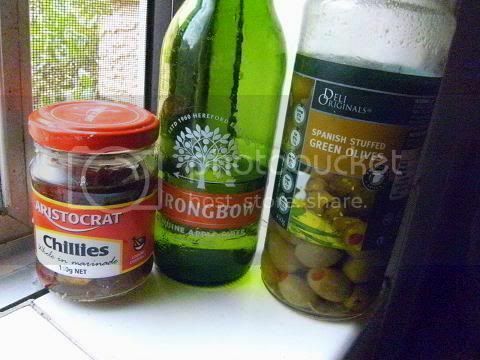 I really want to try the olives now! Your coating looks nice and crisp, fantastic job! Niceee!!! I see you had a blast w/ this challenge once again=;)I see new ingredients like tengle weed powder? how does it taste? All looks fantastic, but I must admit I love the look of the whole prawn tempura. I am so use to seeing just tail, but seeing it complete is extremely visually pleasing. Well done! Fruits tempura is a great idea! You totally outdid yourself, as usual, great job! You always set the bar high! Great job on this challenge. Such original ideas. 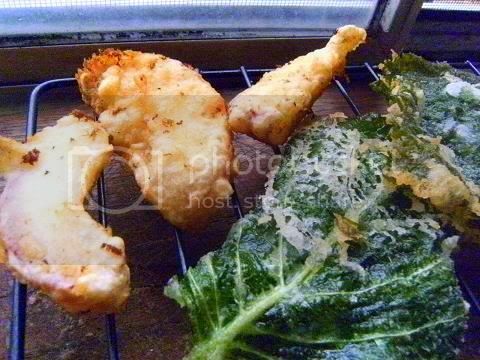 This looks totally delicious - I love perilla leaves but have never cooked with them. Your twists on traditional Japanese is gorgeous ! I love your take on the challanges - I'd never have thought of tempuraing shiso (perilla) leaves,...and now I know the multiple names of shiso. Well done!